Afternoon Loverlies! 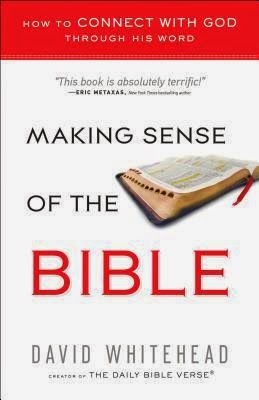 I received Making Sense Of The Bible written by David Whitehead to review. This book will be released on August 19, 2014. I hate to say that I have not finished this book, but I am sure I will sooner or later. It has been really hard for me to focus on finishing this book, I just cannot keep my attention on it. It is easy to read and not a very long book at all. I believe I just had different expectations on how the book would be. So far from what I read, the author has taken certain stories from the Bible and explained why they did what they did. Example: The story of Abram and his son, where God asks him to sacrifice his son. The author I believe did a decent job at explaining that story. I do wish I had someone who understands the story better to talk with, so I can ask questions. I believe this book would be well used in a bible study group at church. There is a chapter in this book called The Epistles, in this chapter Whitehead explains what some of the books in the Bible are written about. This example I took from the book word for word. Example: "ROMANS - The most systematic of Paul's epistles. This letter explains the plan of salvation for the Gentiles and the Jews (Whitehead, p. 68. 2014)." One last thing I want to share about this book, is in the back of the book the author put a one year Bible reading plan. Which I think is pretty neat to have. Just because I couldn't focus does not mean that you all would have the same issue. From what I was able to focus on reading, it seems like it is a good book to grab and read for yourself. Have A Blessed Day! I Want to Read the Bible, but Where Do I Start? The Bible can seem like an intimidating book, but it may be easier to understand than you think. "Making Sense of the Bible "will teach you how to enjoy studying it on your own. David Whitehead has been helping people engage with the Bible for years, including through his popular website, The Daily Bible Verse. The Bible is an incredible gift from God to you, and this brief "user's manual" will teach you how to get the most out of it. Perfect for individual or group use, this book answers basic questions like how to know which Bible version is right for you, and from there introduces you to its stories, people, and major themes. In the end, reading the Bible isn't just about knowledge, it's about connecting with the God who speaks through His Word. Let this engaging book help you hear what He wants to tell you.